I feel conflicted about After the Red Rain. There were some great parts, but there were big weak points. The book started off really cool! Rose was peculiar, which I really liked because I don't find many male main characters who are like that. There was a cinematic feel to the world and writing. (I'm not entirely sure why, though. That's just the vibe I got.) The world was intriguing, despite the flaws in it. It felt a little different. My interest was piqued early on. There was some action packed scenes, good twists, and neat technology. All these things made the book enjoyable. Then, somewhere in the second half, things became . . . odd. It was a bit ridiculous at times and sometimes the concepts seemed gimmicky. It could've been pulled off better. The world building was loose--not strong enough. I would've liked to see more history. I didn't get a good grasp on why the world was the way it was. This sure contributed to the gimmicky feeling of some of the concepts. If the world building was stronger, then maybe I would've liked the ideas of the world and characters more. I was left with a poor impression of the book because the ending was meh. The conclusion was weak. It could've been better. 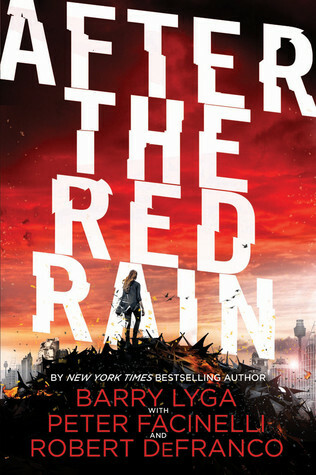 After the Red Rain is one of those books that initially seems awesome, but over time, the cool feel to it pales. I didn't think it was that great after a while. I still liked the book (because of the good first half), but at the same time, I didn't (because of the last half). If you're really interested in this one, I say go for it. It's not a must read, though.